The Healing is Always Christ: Help My Grown Child Get Well, LORD! Please Heal Her! We Love Our Children with Passion and Abandon. A Salvation Prayer! Poem. Help My Grown Child Get Well, LORD! Please Heal Her! We Love Our Children with Passion and Abandon. A Salvation Prayer! Poem. Christ Jesus Lifts Our Precious Ones Up With His Love, Mercy, Compassion, Healing and all that God is and has- unlimited and boundless power and magnificence, full of grace upon grace, Who is just, all-powerful, omnipresent and omniscient. You will see all of these qualities and more when you read today's posting of a true happening with Jesus for a mother, Sandy Hill, and her grown child, Emery. Sandy is one of those rare, lifetime and dear, close friends- one whom I have admired, loved and shared friendship since we were seventh graders at the young age of 12 years old. I could not be more blessed that Sandy and I have a group of girlfriends/chums, who still keep in touch and get together whenever we are able. Now that our children are fully grown, it is easier to meet from places around the United States. Sandy is extra special to me because she is so kind, caring, and above all, has a deep faith in Jesus Christ. We share in that single-minded fellowship; there is nothing else like it because faith in Jesus, the Messiah, is matchless and forever. I value her highly for encouraging me in our Lord and Savior. ***A Salvation Prayer*** toward the end of today's posting. Young child or fully grown, we parents never, never give up or let go of our daughters and sons! They are more precious than any fading gold or silver could ever be! Acts 3:6-7 New International Version (NIV) 6 Then Peter said, “Silver or gold I do not have, but what I do have I give you. In the name of Jesus Christ of Nazareth, walk.” 7 Taking him by the right hand, he helped him up, and instantly the man’s feet and ankles became strong. One of the strongest bonds of humanity is a parent's love. We get a glimpse of how God- the Father, the Son, and the Holy Spirit- LOVE/S us more than anything, beyond any comparison. There is no greater love than the love of God Who lay down the life of His Son, Jesus, and Jesus willingly took that upon Himself to set us free! I was willing to trust that God would give Emery the strength to fight through the pain. Her "healing was in Christ!" returned to the work she loved sooner than expected. that suffering into an outreach to others. Now that's what we call a "blessing!" I love you so, Sandy!!! Always and forever, and thank you immensely for sharing this dream that God gave you. I really cannot find the right word/s to express how special and promising it is; what hope it gives us all. There is nothing like seeing and hearing from our Lord. This is how much He loves Emery, Dave- your husband- and you, your whole family. Praise Him mightily!!! God loves each person this much. When we say, "Yes!" to God about Jesus Christ, His limitless Love surrounds us as He walks daily with us. Dear Father in Heaven, I want to know You and to be with You forever one day when I leave this first part of my Life. I believe that Your Son, Jesus, died to take away my sin. You are Holy, and Jesus is the Lamb of God, the Only ever Perfect God and yet fully Perfect Man. He came to die on the cross, to be resurrected, then to be with many people here before He ascended to Your right hand to intercede for each of us. I have made mistakes, and I want Your forgiveness. I know that the Holy Spirit Who came- that is why Jesus ascended to Heaven- will be in my heart and mind and give me help, guidance, and comfort, understanding of the Word. Thank You! In Jesus' Name, Amen! 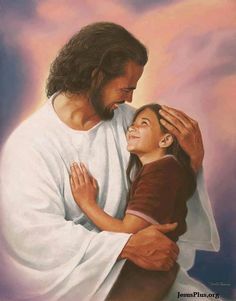 Thank you so much to Pinterest for this gorgeous picture of Jesus with a little girl, one of His own!